House, 3 Bedrooms, 3 Baths (Sleeps 6 maximum). If you want to be RIGHT ON THE BEACH in a private, upscale community with a dedicated private beach & few crowds, private dune walk-over off the living area deck & water on 3 sides of your vacation home, this is your spot! The Gulf of Mexico is on the South side, Lake Carillon is on the North side, & the Carillon Beach Pool House is on the West side. Light, bright, quiet, maintained & beautiful, this immaculate home will provide the environment for the rest and relaxation you are seeking! Fairview cottage is a 3 bedroom, 3 bath gulf front AND poolside home that can sleep up to 6 people very comfortably. We offer a king, queen and two twins as bedding. Fairview has a full compliment of audio equipment for your enjoyment as well as a 55" Samsung HDTV with USB, HDMI, DVD and more. The gourmet kitchen is fully stocked for those who prefer to cook and dine at home. You can enjoy your meals and an unobstructed view of the Gulf of Mexico at the picnic table on our gulf side deck and after you can head down to the beach on our private dune walkover- it's not shared with any other cottage! Fine linens, writing paper, books, videos, puzzles and games are all here for you to enjoy. We also have a complete set-up for those traveling with infants and small children including a Graco port-a-crib with all linens provided, 2 baby gates, a high chair, children's dishes, sippy cups and silverware and a portable stroller. Bicycles and a charcoal BBQ grill are also on site for your use as desired. Fairview is a great home for two families traveling together! Come experience our snow white and powder soft beach, 3 pools, 2 tennis courts, children's playground with picnic area and basketball court, our lovely new downtown shopping and dining district and so much more! You can bring your jet skis and launch them on Lake Powell directly outside our community gates and when Phillips Inlet is open you can ski into the Gulf of Mexico! Jet skis are also available for rent locally. Bell Carillon with seasonal concerts is located in center of community. Carillon Beach 'Meeting House' can be reserved for weddings/business meetings through the Carillon Beach office. Non denominational Sunday worship service at 10 a.m. weekly at the Meeting House. 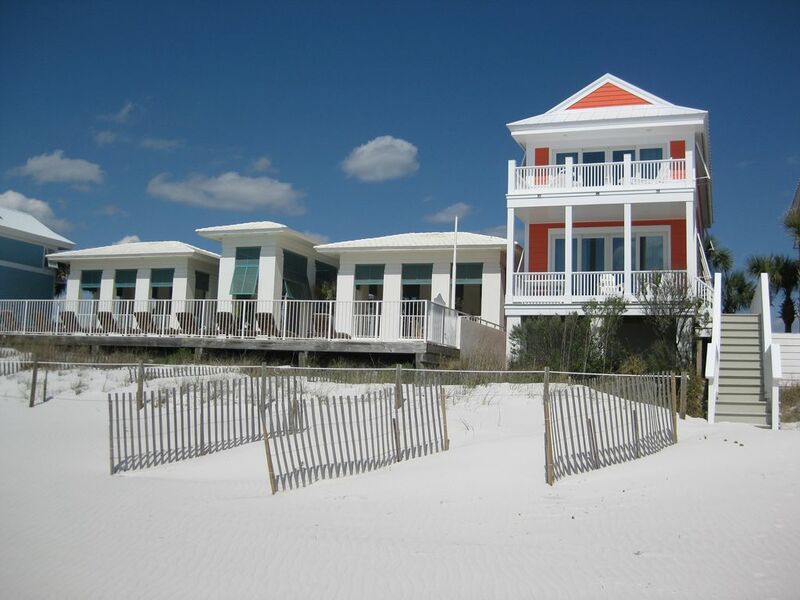 Keywords: beach house, gulf front, Carillon Beach, Fairview cottage, Florida vacation, beachfront, gulf, pool, beach. Have been renting this property since 1994 (24 years)! Honest, dependable, available owner/manager with an extensive client list and references. Please call if any references needed/desired. I built this home between 1993-94. Unique property that is GULF FRONT, RIGHT NEXT DOOR TO THE GULF FRONT POOL COMPLEX, AND HAS LAKE CARILLON IN FRONT OF IT! ONE OF A KIND PROPERTY! Must be seen to be appreciated! TOTAL rest and relaxation! The cottage is COMPLETELY stocked and generously so, with everything you can think of to make your vacation the best one you've ever had! Just pack your clothes- the rest is here for you. Fairview cottage is RIGHT ON THE GULF! Carillon Beach shopping/dining district on site. Carillon Beach is an exclusive, upscale resort community. Located at the quiet west end of Panama City Beach. Entire village of Carillon Beach is adorable! Fairview cottage is both RIGHT ON THE BEACH AND WITH LAKE CARILLON ON THE NORTH SIDE OF THE COTTAGE. Lake Carillon is right outside the front door on the north side of the cottage. We have our own private walkway down to the beach from our gulf side deck. Wow! Beautiful lake views from north side of the cottage. Lake Carillon is directly north of the cottage. Great views right from the gulf side deck! Superb view after superb view! Both lake and gulf location. And right next door to the gulf front pool complex so there is water on 3 sides of the cottage. All linens provided including those for infant crib. 1st class fitness club located in the downtown Carillon Beach shopping area! Fully stocked gourmet kitchen! You will find everything a kitchen could have! (2) 2 bedroom balconies on the north side of the cottage. In the garage- please use as you wish! (2) 2 fantastic decks overlooking the Gulf of Mexico- one is off the living room, and the other is off the master bedroom. Jet skis/Sunfish can be rented on site from beach service provider. 2 tennis courts located within the Carillon Beach community. Within short driving distance- about 15-20 minutes. (3) Fairview cottage is located RIGHT NEXT DOOR to the gulf front pool complex in Carillon Beach. There are 2 other pools in the community as well. Just a first class property managed by the owner who cares about your stay at her home! Everything you would find at home is here- all the comforts of home. Not like any hotel/condo, or other private rental! We loved our stay. Being right on the beach was amazing and perfect for the little one taking naps. The sun sets were just stunning. Can't wait to go back next year! We had a wonderful stay at Fairview Cottage! We loved having the beach just steps away and the house had everything we needed. It was very clean upon arrival and when we needed to contact Mrs. Smith during our stay she was extremely accommodating. We hope to be able to stay at Fairview Cottage again. - We had our own private stairway to the beach with 2 chairs and an umbrella set up every morning for us to use through out the day. We do wish the chairs were a little closer to the water because with the rough waves we felt like they were too far away so we ended up setting up our own chairs closer to the water. - The convenience of the pool next door was great! I feared it would be loud, but it was actually not that bad...and the security clears everyone out at 10:00 pm. We just wish they would turn off the pool lights at night. - Lots of great things to do in the neighborhood, basketball & tennis courts, shops, green spaces. Having the 6 bikes was great but just know that there are 2 adult bikes, 2 middle size bikes and 2 on the much smaller size. - Kevin does an amazing job of cleaning the house. Unfortunately the people before us were beyond messy (shame on you!) so Kevin was still cleaning when we arrived at 4:00. But he was a fantastic person and made sure we had everything we needed before he left. - This was by far the most fully stocked Kitchen/house we have ever stayed at. She had everything I need to cook every meal we had. Soap in every bathroom, plenty of bath towels, toilet paper, paper towels, outdoor sand toys, boogie boards, chairs for outside, bikes. - The only downside is that with 6 people there wasn't quite enough comfortable sitting space in the living room. We ended up moving some of the chairs from the bedrooms into the living room and that made it much more enjoyable. - Denise was wonderful to work with. Her communication on the front end, which included great paperwork with instructions and information, as well as her communication throughout the trip as well as afterwards when we thought we left something behind. Thank you Denise for making it a wonderful stay! I highly recommend this place and we would stay here again! Great communication. Went above and beyond. We needed to cancel our trip due to a family situation. While our payment for the home was non-refundable, Denise was very helpful getting me documentation needed for our claim with our trip cancellation insurance coverage. We will definitely book another visit with Denise and hopefully will get to enjoy the trip next time. Fairview in Carillon beach was Awesome ! Fairview in Carillon was Awesome! The area surrounding the community is very quiet and peaceful. All the activities of Panama City Beach are within 15 minutes of the community. Please note: Summer rentals from 5/25/19 through 8/11/19 are weekly only and on a Saturday to Saturday reservation schedule unless last minute and not booked. Deposit of 50% of quote is required when reservation is made in order to reserve the cottage. Balance of payment due 60 days prior to contracted arrival date. Please consider purchasing trip cancellation insurance for your trip as there is a no cancellation policy in effect for any reservation at Fairview cottage. Payment preferred via personal check but I do accept credit cards. Please refer to the rental agreement you sign for complete details on rental terms and conditions. Guest will be required to sign a rental contract and provide identification. Community quiet hours 10 p.m. until 7 a.m. Max occupancy is 6 people. No smoking. No pets.